Ca 1870, Kang Don Do Province. 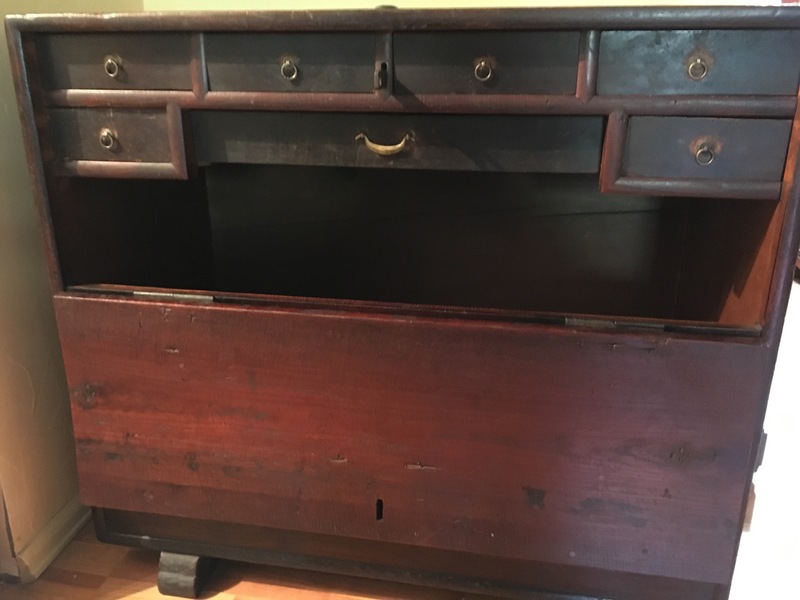 Solid chestnut, unique locking system and drawers arrangement inside suggest piece used by elite class. 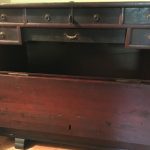 36.75″ w, 18.25″ d, 33.25″ h.
This solid, masculine-looking chest is rare. It is a good example of furniture favored by the elite class in Neo-Confucius society who valued quiet strength and simple form without too much unnecessary decorations. Except for the few plain-looking iron lock-plate and hinge-plates in front, this chest is devoid of any decorations. This elite class of people valued an expensive wood like the chestnut with its smooth lustrous reddish sheen, and the craftsman let the wood speaks for itself. The piece looks “grounded”, with a very simple frame but shows traditional construction details of dovetailing and wooden nails. 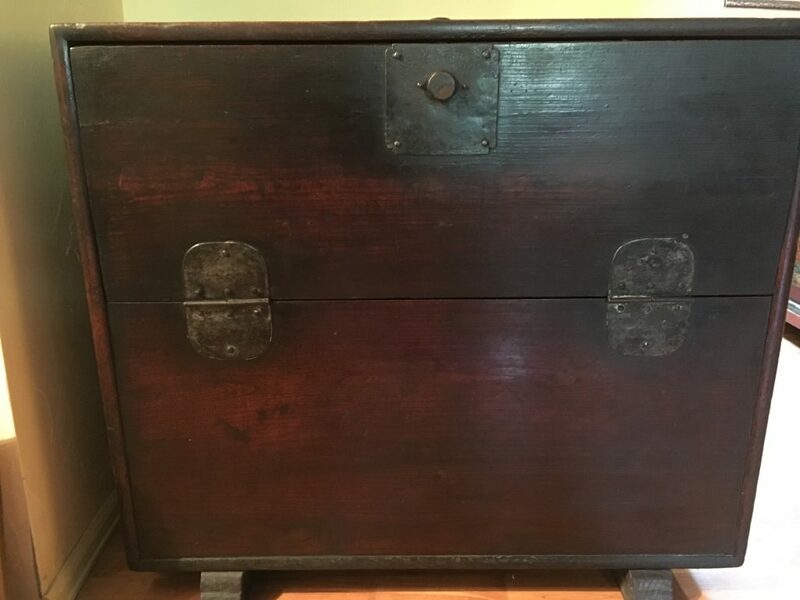 A unique part of this chest is in its locking system. Instead of the usual clasp-lock that has a lock-plate starting from the surface of the top panel, bends and terminates on the lock-plate on the top of the hinged half-door of the chest, the locking device is covert. 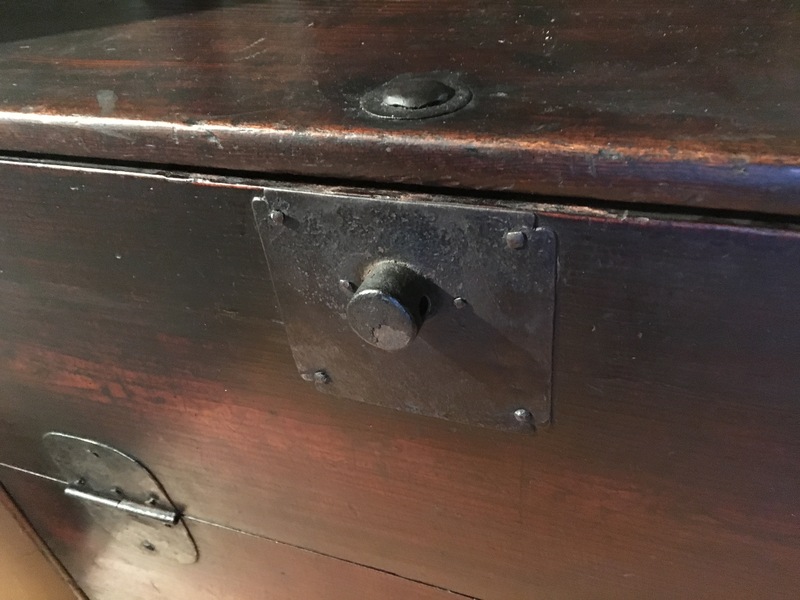 It is hidden below a metal disk on the surface of the top panel, which has a metal pin penetrating the wood and connects to an ingenious locking mechanism behind the square-shaped lock-plate with a knob in the middle. This knob can turn and perform its locking function of opening or closing the half-door. This system is seldom seen on any other Korean chest. Inside the chest are two rows of drawers at the top to hold the scholar’s small personal belongings. 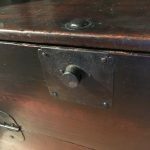 The rather narrow opening below the rows of drawers to the storage compartment makes this chest a document chest rather than a clothing chest. The simple elegance exuded by this piece and the use of expensive chestnut wood mean the scholar used it for storing his valuable manuscripts and scrolls in the men’s quarter of the house. He might use the top to display antique vases and other curios, or his own scholarly accomplishments like calligraphy and paintings on stands. This chest survived in excellent condition. It retained its original lustrous reddish dark lacquer. With its smooth-looking wood and restrained metal decorations, it shows a quiet elegance that would fit into any surrounding, traditional or contemporary. It has never been in the West until it became part of our collection. Its antiquity was certified by a Professor of Korean History and Culture in the 1900s. Authentic antique chestnut furniture is known to be valuable anywhere in the world. This unique piece is definitely a serious collector’s item.